Juniper Hairstreaks are sprightly little butterflies with varying color forms that predominate in different parts of their range. Where I live in the east, the ‘Olive’ Juniper Hairstreak is present, sporting a sparkling bright green and brown coloration. The Juniper Hairstreak is named after its caterpillar food plant, which is Eastern Red Cedar in much of the eastern two thirds of the United States, east of the Rocky Mountains. 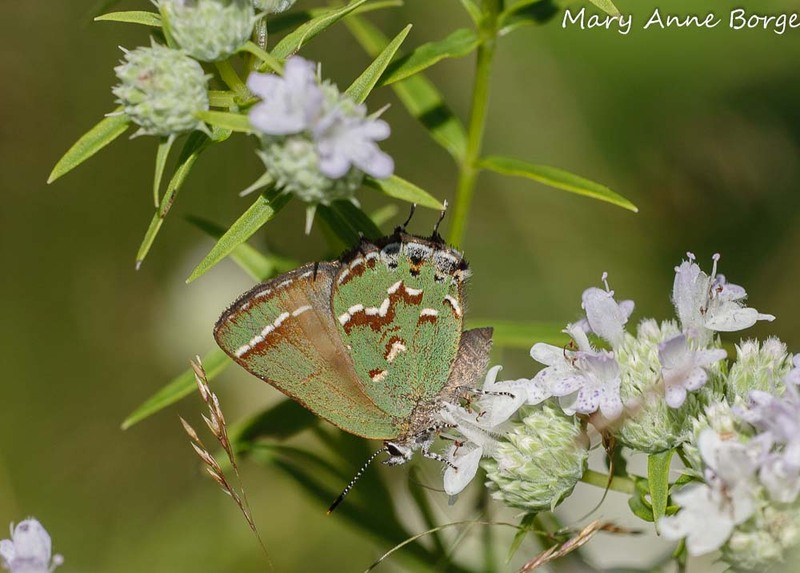 To understand the origin of the butterfly’s name, it helps to know that this plant is actually a juniper, reflected in its scientific name, Juniperus virginiana. Juniper Hairstreak’s distribution is sometimes described as ‘locally common’, because this butterfly is usually found in close proximity to its caterpillar food plant. Male Juniper Hairstreaks spend their time perched on the branches of their caterpillar food trees, waiting for a receptive female to appear. Eggs are laid singly on the tips of the tree branches. Adult Juniper Hairstreaks visit flowers of many perennials for nectar, but this is most often in the vicinity of their caterpillar food plants. 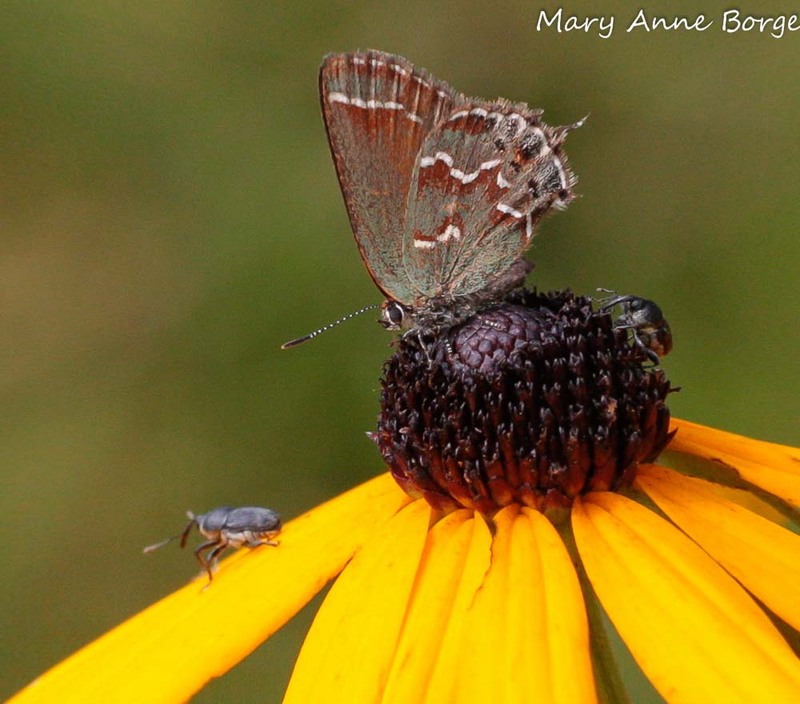 In my area, they seem especially fond of nectaring at Mountain Mints (Pycnanthemum species), but I have also seen them feeding on coneflowers and other aster family members. Eastern Red Cedar is an evergreen tree with a shape that is generally pyramidal or columnar. It usually grows to a maximum height of about 40 feet (12+ meters), although in the right conditions it can grow taller. It does best in full sun. Eastern Red Cedar can tolerate moist to dry soils but is especially well adapted to dry conditions, making it a good candidate for locations where drought is a concern. It is effective alone as a specimen tree, or on larger properties it can be used for privacy screening or to line a driveway. Its deep root system enables Eastern Red Cedar to stand up to strong winds, so it also makes an effective windbreak. It can even stand up to tropical storms. 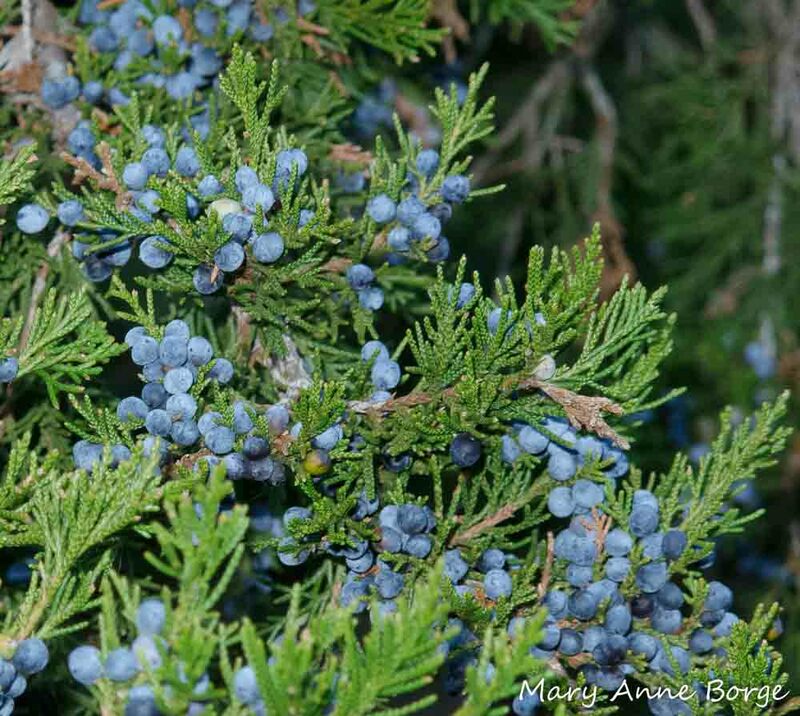 The evergreen foliage of Eastern Red Cedar provides year-round visual interest. It is accented by the changing color of its fruit, which begin to develop in pale shades of grayish blue by mid to late spring, ripening throughout the summer to a deep blue. Often some fruits will remain on the trees through much of the winter. While these fruits look like luscious berries, they are actually cones. Although there are occasional exceptions, Eastern Red Cedar generally has male and female reproductive parts on separate plants. At least one male is needed in the neighborhood to produce pollen. Only the female trees will have the showy berry-like cones. Eastern Red Cedar relies on wind to achieve pollination. In addition to being a caterpillar food plant for Juniper Hairstreaks, Eastern Red Cedar is great for birds. The berry-like cones provide food from late summer through much of the winter for many bird species. The social Cedar Waxwings, for whom fruit is a larger part of their diet than it is for most birds, were named for their love of these cones. 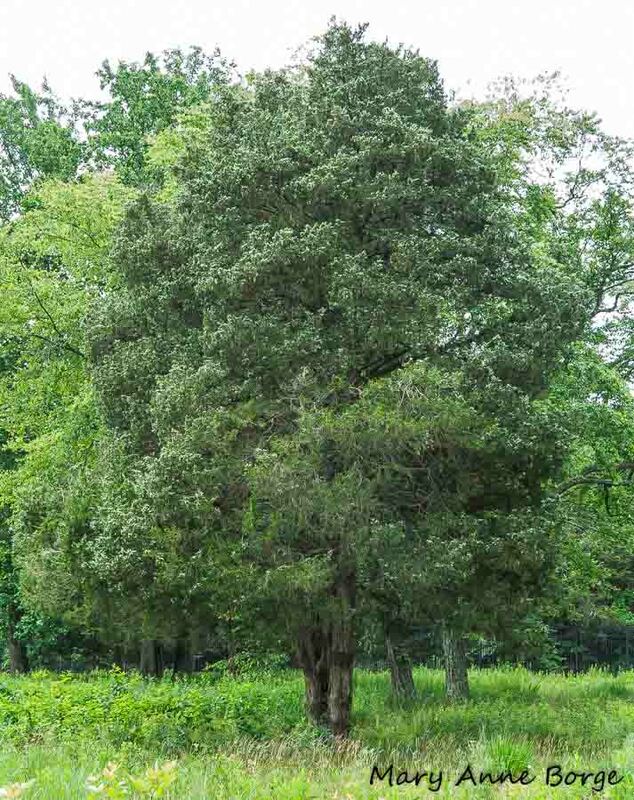 Eastern Red Cedar’s dense foliage provides good coverage for small to medium sized birds who are looking for a place to perch safely out of view and reach from larger predators. Eastern Red Cedar is a hardy tree that reproduces readily. It is sometimes referred to as a pioneer species, since it is often one of the first tree species to appear in fields and meadows. This is usually the result of its seeds passing through the digestive system of birds, a process that increases the chance that the seed will germinate successfully. What do Juniper Hairstreaks and Cedar Waxwings have in common? Both depend on Eastern Red Cedar for food. Juniper Hairstreak caterpillars rely for their survival solely on this tree species . 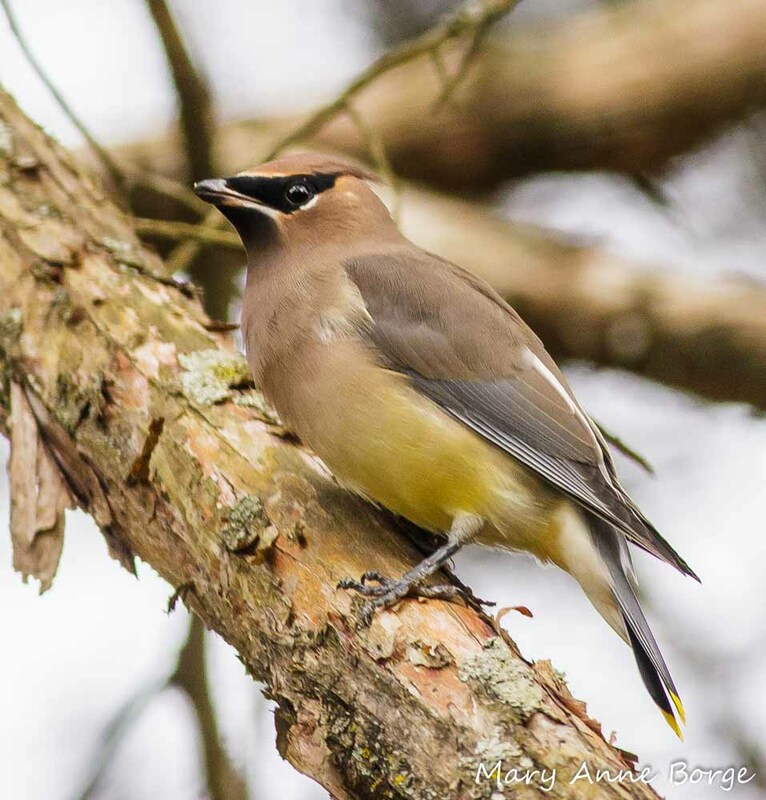 Cedar Waxwings have a strong preference for the cones of Eastern Red Cedar, but also eat many other fruits. The names of both of these animals reflect the strong association between them and Eastern Red Cedar. Watch to see how many different bird species dine or take shelter in Eastern Red Cedar. If there are good nectar plants nearby, you’ve found a hospitable home for Juniper Hairstreaks, too. 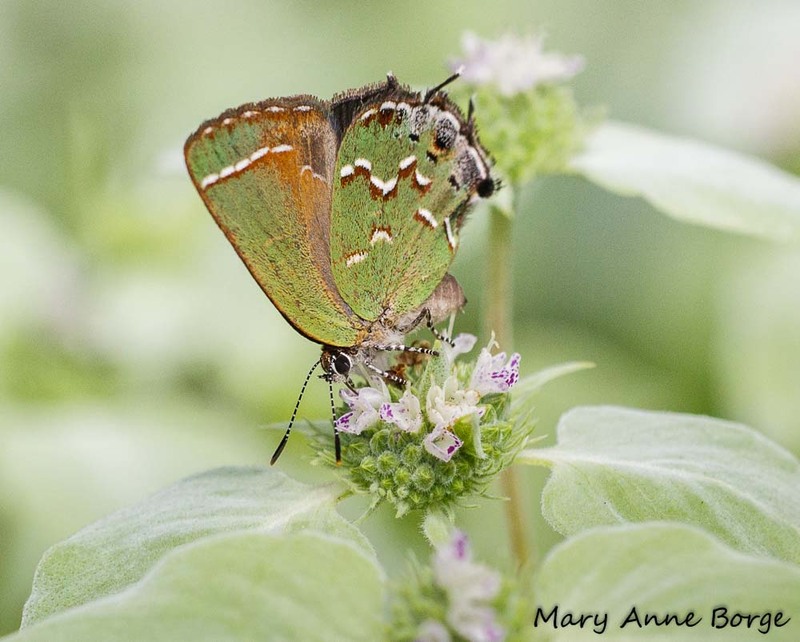 This entry was posted in Birds, Butterflies, Native Plants and tagged Cedar Waxwing, Eastern Red Cedar, Hoary Mountain Mint, Juniper Hairstreak, Juniperus virginiana, nature, Pycnanthemum incanum, Pycnanthemum muticum, Short-toothed Mountain Mint by Mary Anne Borge. Bookmark the permalink.